This week’s WordPress Weekly Photo Challenge is Shadowed. As I was reviewing some photos I took this fall, I paused to look through a gallery from Magnolia Plantation and Gardens in Charleston, South Carolina. The morning we visited, the fog quickly lifted, and it didn’t take long for that soft morning light to disappear. Without clouds, the bright sun quickly took control. 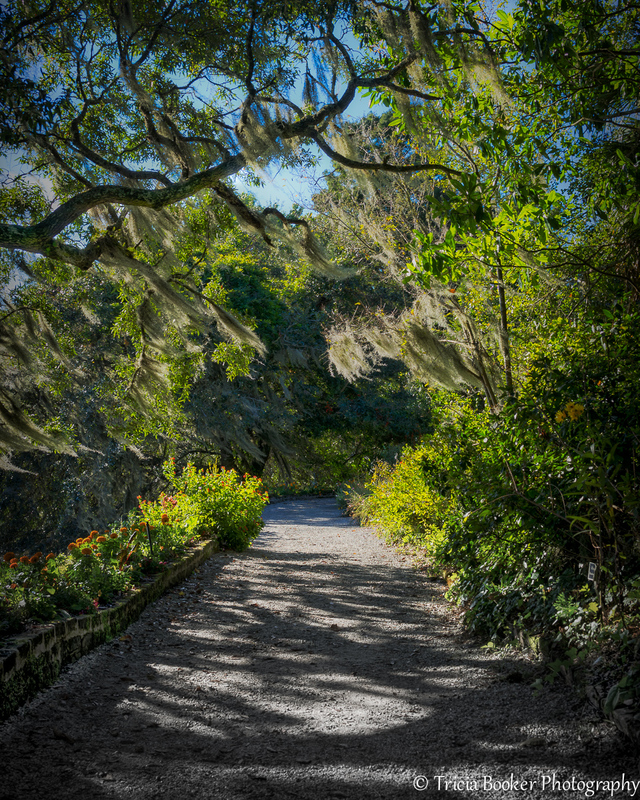 Thankfully, Magnolia Gardens has beautiful paths that wind through their many ecosystems, from the Audubon Swamp to the formal gardens and everything in between. So while the preferred light may have vanished, we still had plenty of other options to keep us entertained. As my Mom and I walked, I kept seeing the light play through the Spanish moss, creating shimmering shadows. There weren’t many flowers in bloom, but at this point in the garden a few survivors caught some morning light and added reds and oranges to the rich greens. This image was edited in Lightroom, and I applied the Clarity and Saturation sliders to enhance the colors. As an experiment, I also used the Graduated Filter on the lower quarter of the image to remove the color, gradually taking the shadows to black and white. What fun….I opened the picture and was able to make everything smaller until I was just looking at shadows on the ground. Would one ever imagine what created them without the entire picture? Thanks for making my day more interesting! Yes, it was a lovely place to wander! Thank you for visiting my blog! What a lovely pathway, and so sweet of you to share your editing secrets for this beautiful capture. One day I hope to make it there. My very favorite spot for photography – so happy you loved it. You are so fortunate to live there, Tina! I try and visit each time I’m down there. It seems there’s always something new to discover, too.